Fiamma has a wide range of enclosures for all motorhome, campervan and caravan needs. Privacy Room enclosures transform your Fiamma awning into a comfortable living area with front and side panels that you can buy separately to compose your space as you like. Fiamma's range of awning enclosure Privacy Rooms are ideal for any kind of recreational vehicle from big motorhomes and caravans to mini vans. For an at-a-glance view of the features and details of the Fiamma Enclosures and Privacy Rooms download the printable PDF chart. - vinyl fabric, front + side crystal windows with net, 6 piece ocean curtain kit and skirting all contained in a Mega Bag. - vinyl fabric, front + side crystal windows with net and 6 piece ocean curtain kit all contained in a Mega Bag. - polyester fabric, front crystal window with net, side window with roller blind and net, 2 piece ocean curtain kit all contained in a Mega Bag Light. - vinyl fabric, front + side crystal windows with net, 6 piece ocean curtain kit. 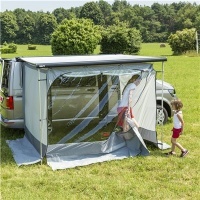 Fiamma Zip, Caravanstore Zip and Privacy Room are equipped with elegant Crystal windows that can be rolled up, complete with mosquito net and blue curtains. The height of the velcro layer has been increased so as to simplify the closing of the awnings. Light versions are provided with roller blinds on the side panels instead of the Crystal windows. Fast Clip - The Fast Clip is the fixing structure standard delivered in Fiamma Privacy Rooms. The Fast Clip CS version is especially designed for the Fiamma Privacy Room CS Light. The Fast Clip works with the principle of the profiles hinged with the spring system Quick Lock fastened in the sandwich way. It is made in anodized aluminium. The side panels of the Privacy Room are quickly and easily joined with the fabric of the awning. Rapid Set - Fiamma Zip and Caravanstore Zip are standard delivered with the aluminium poles Rapid set. This fixing structure is composed by a horizontal rafter to be inserted in the side panels and by a telescopic vertical rafter next to the wall of the vehicle to increase stability.